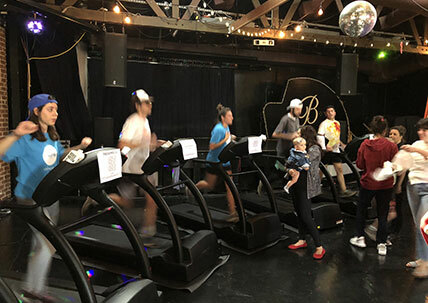 Enter donation amount above BEFORE clicking "Donate Now"
How It Works There will be 6 treadmills in the bar, each will total 26.2 miles, the length of a marathon. 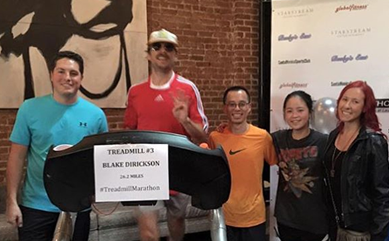 One person (Blake Dirickson) will run a full marathon by himself. The other 5 treadmills will be available to teams of people who will collectively run a full marathon. Each runner will hopefully find a sponsor to sponsor their run, or you can sponsor yourself. The event is open to the public, kids are welcome and always love the event! Food and drinks will be available for purchase. If you’d like to sponsor a runner, please use the DONATE link on this site and make sure to type in the runner’s name in the Sponsor section of the donation link. A donation will guarantee you entrance into the event. All donations are tax-deductable. The Santa Monica Sports Club produces athletic events to raise funds for charity. The Club's signature event is the Treadmill Marathon which began as a one person race and has evolved to include over 50+ runners. Improve the physical health of members and the financial health of non-profits. Generate funds for charitable causes. Celebrate corporate sponsors and students. Empower social change through physical action. We want to cultivate a culture of healthy, civic-minded, and caring members. Copyright 2019 TreadmillMarathon. All rights reserved.